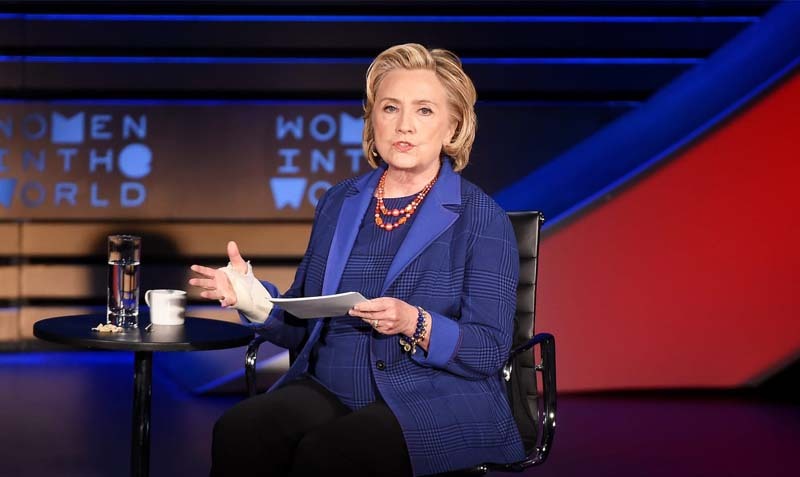 It was a rare treat to see Clinton on the other side of microphone, asking tough questions and leading a super smart discussion about a topic she clearly knows all too well: how to deal with egomaniacal men. She kept her own opinions largely to herself save a few well-timed comments and choice digs that drew raucous applause. “If I were in a position to be concerned about Russia,” she said and paused when segueing between legendary Russian journalist Yevgenia Albats and BBC’s former China editor Carrie Gracie. Instead of basking in the spotlight, Clinton guided a conversation she did not dominate. Each of the highly informed women offered her praise, calling her Madam Secretary, and making sure everyone in the crowd knew they wished she was the American president. Ece Temelkuran, a journalist and author from Turkey, was the first to say exactly what seemed to be on Clinton’s mind. When asked about how Turkish President Recep Tayyip Erdoğan was able to transform Turkey, she warned that her country used to be “normal” like the United States, too. Clinton’s subtle Cheshire cat smile was her only reply. The hour-long conversation touched on a variety of topics about these strong men regimes that all sounded slightly familiar here. Gracie suggested that if the West wants to regain its power against Russia and China they might “show, not tell” that the West does it better.